What does it mean to ‘live the blues’? 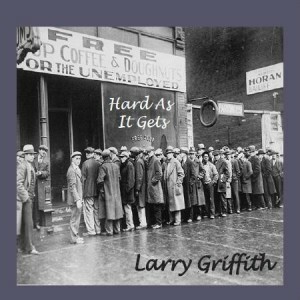 The cover art of the great new album from Ohio native Larry Griffith is a black-and-white photograph, depicting several men in various hats, lined up to receive a “FREE Cup Coffee and Doughnuts for the Unemployed”. “Free Soup,” read two hopeful words in the shop’s window. This is about as Hard As It Gets in life, and Larry would know. According to his website, “Larry was brought up in the inner city of Cincinnati by a single parent along with nine other siblings. The dilapidated, three-tiered tenement literally shook with the radio and vinyl record sounds of everything from blues, gospel, and soul to jazz.” Now an Atlanta resident, Griffith has since produced all-new material, twelve original songs for this CD. Alongside him are guitarists Mike Lowery, Rara Starblanket, and Delta John Harris; bassists Dustin Sargent, Rara Starblanket and Tommy Vickery; keyboardists Kevin Thomas, Rara Starblanket, and Bobby Mobley; blues harmonica player Jeff Baker; drummers Damian Lewis and Larry himself; and additional vocalists Stephanie Carll, Jon Harris and Rusty Hayes. Track 02: “Help I Don’t Need” – Something strange is going on between our narrator and his lover, and it doesn’t take a brain surgeon to figure out what it is: “Milkman, mailman, both crowd around my door. Butcher showed up this morning with meat from the killing floor. And when the preacher got the Holy Ghost, I could swear he called your name. I bet I’ll catch you speaking in tongues; I swear I’m going insane.” Some help is the kind of help we all could do without, but Griffith needs none in the romance (or electric guitar) department. Track 03: “Damn If It Didn’t Rain” – In this soul and gospel gem, the moral is that sometimes one’s most fervent petitions don’t get answered, even in desperate times. “Well, I prayed for something, oh, to guide my way; then I begged Almighty; then I prayed all day…Lord, Lord, Lord, damn if it didn’t rain!” Delta John Harris plays fantastic slide guitar, and Stephanie Carll, Jon Harris and Rusty Hayes also harmonize beautifully with Larry, in this tune with a tempo and melody similar to Chuck Berry’s “Maybelline”. Track 04: “Hard As It Gets” – Everyone’s had one (or more) of those days where absolutely nothing goes right: “I go to buy groceries; ain’t got no cash. Back to my car, ain’t got no cash. I start walking; tears stain every step. Oh, can’t get much harder. It’s just about as hard as it gets.” Rara Starblanket does triple duty here on guitar, bass and keys. Blues fans, if life’s as Hard As It Gets, pop this pepper-upper into your player and party!